Watch a preview of the Introduction to Auslan Linguistic Elements Video in YouTube. If you are unable to see it, your school may have blocked YouTube. You can ask your school to permit it, or view the video at home. The 5 Auslan Story without Pictures Videos includes 5 short Auslan stories, about 2 - 4 minute each, signed by a native Auslan signer from the Victorian state. All Auslan story videos are the same as the ones used in 5 Auslan Story Videos for Beginners and Intermediate, except that they do not include pictures. 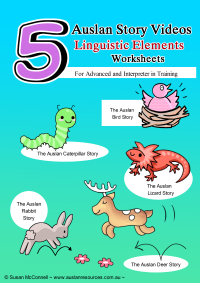 The Introductory to Auslan Linguistic Elements Video is 30 mintues long, and it includes explanations of linguistic elements being used in the 5 Auslan stories. Each explanation is in Auslan with English subtitles so any person who is learning Auslan is able to pick along quite easily. Linguistic elements covered are: tokens, surrogates, role shift, facial expressions, mouth patterns, eye gazing, eye gazing classifiers, proforms, classifiers, fingerspelling, signs, noun-verb pairs and mirror signs and mirror handshapes. Once payment has been made, an email will be sent to you in 1 to 3 business days with a Drop Box link where you can download the e-book and videos. The 5 Auslan Stories e-book and videos are copyright and for personal and school classroom use only. The e-book is to be printed only once its entirety per individual/teacher and the individual/teacher may photocopy the e-book as many times for personal and classroom use. Please do not photocopy, reprint or distribute the e-book and videos to other individuals or teachers, please direct them to this website to purchase them instead. For Individual Auslan Teachers and/or Companies - if you would like to use e-book and videos from Auslan Resources as part of your Auslan teaching business, for example, teaching private Auslan classes or community Auslan classes, please contact me for permission and special deal discounts.